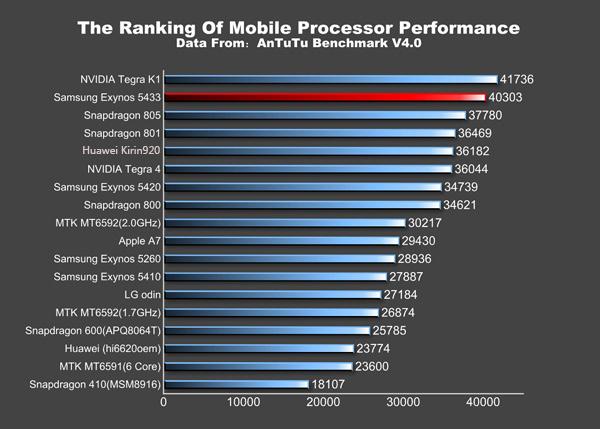 New benchmarks have hit AnTuTu this week, showing off the performance of the upcoming Galaxy Note 4 from Samsung, powered by an Exynos 5433 processor. The 5433 is Samsung’s new in-house 64-bit octa-core processor, featuring four Cortex-A57 cores and four Cortex-A53 cores. In addition to enhancements made to the CPU, the GPU featured is a next-gen Mali-T760, capable of keeping pace and even outperforming the Snapdragon 805 and its Adreno 420 GPU. 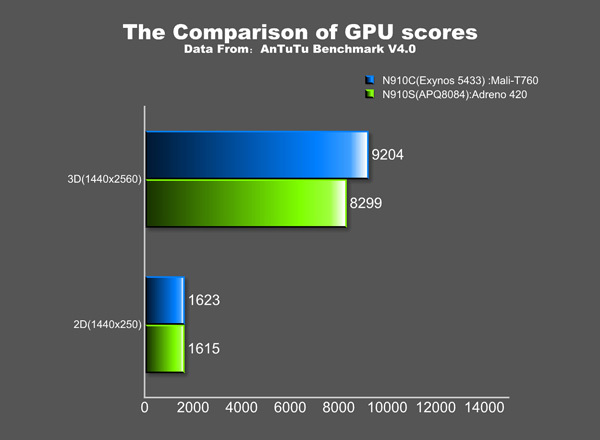 From what the benchmarks show us, only one processor is currently benchmarked higher, that being NVIDIA’s own Tegra K1 processor which powers the SHIELD Tablet. As of right now, no phone available on the market currently features the Tegra K1 processor. According to the latest data collected, the two Galaxy Note 4 variants powered by both the Exynos 5433 (overseas) and Snapdragon 805 (US variant) will be powered by 3GB of RAM; not 4GB like previously rumored. The other bit of info provided from the benchmark shows that 3D graphic performance on the device’s QHD display is better handled by the Exynos 5433, while basic 2D renderings are basically identical. Even though the Exynos 5433 outperforms the Snapdragon 805 a tad in this category, both are supercharged processors, meaning buyers probably won’t have anything to worry about with regard to mobile gaming and web browsing. We will be on-hand in New York at Samsung’s satellite event for the Galaxy Note 4 announcement, so you can guarantee that there will be plenty of Note 4 coverage coming up, followed by a full review of the device.